During their wedding ceremony in November 2017, Stefanie Sacknoff and her husband asked someone very special to join them at the altar: Stefanie’s bone marrow donor. Stefanie held hands with her donor and toasted her out of gratitude. Because of this woman, along with countless and nameless blood donors, Stefanie is not only alive — she is healthy, happy, and thriving. At an early age, Stefanie was diagnosed with aplastic anemia, a bone marrow disorder that caused her to be blood-transfusion dependent until she was 20 years old. It wasn’t until 2007, when Stefanie was in college, that she found a match for a bone marrow transplant. She spent three months in the hospital where she underwent chemotherapy and received the new bone marrow that was in liquid form through an IV. Throughout this process, Stefanie was constantly needing blood and platelet transfusions. Because of the transplant, Stefanie’s college courses were delayed. But she soon returned to the University of San Diego to complete her degree and shortly after, she enrolled in the George Washington University Physician Assistant (P.A.) program. She’s now been a P.A. for five years, focusing specifically on the areas of hematology and oncology. More than anything, Stefanie loves spending time with her family, including her husband and black labrador, her two sisters, and her mom. She enjoys being active, trying new restaurants around San Diego, and attending concerts. Because of the significant role the San Diego Blood Bank played in her journey, Stefanie also loves visiting the Blood Bank and attending blood drives as often as she can. She is grateful for the many donors who give to save others, because without them, she wouldn’t be alive today. 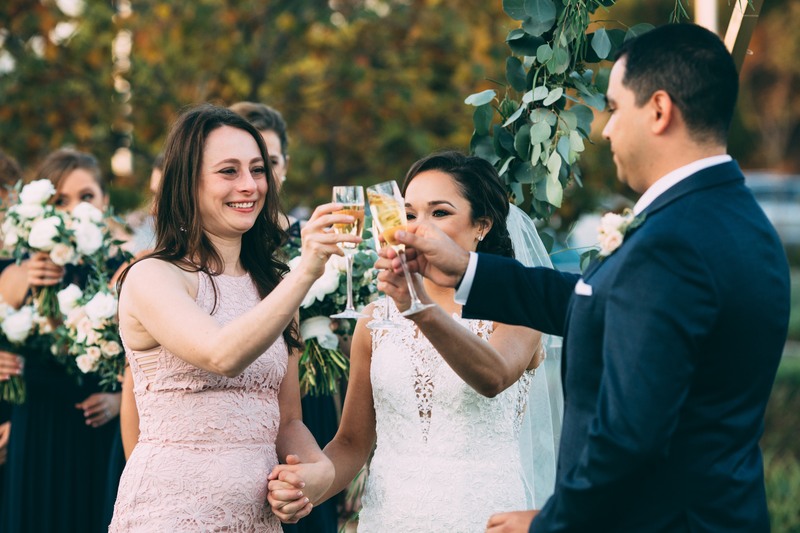 Pictured above: Stefanie's bone marrow transplant donor joined her for a toast of gratitude at Stefanie's wedding.